It wasn’t the right match, they said. He wasn’t the right boy for her. He didn’t come from a good enough family. He wouldn’t provide well for her and any family they might have. It just wouldn’t work out. Her mother in particular was opposed to the whole idea. She didn’t worry, because he was too young to get married there in Oklahoma, that October of 1916, without parental consent — and both of his parents were dead. She didn’t count on them running away to Texas where he would lie about his age and they would get married anyway. Perhaps she continued to think it. And, of course, it didn’t. 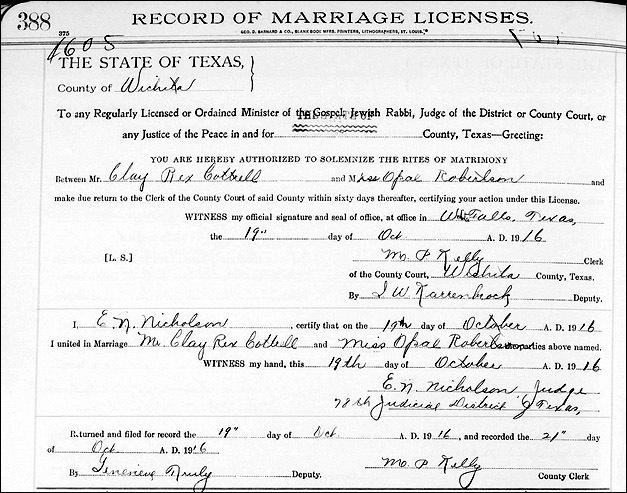 The marriage that began on the 19th of October 1916, in Wichita County, Texas, between my grandfather Clay Rex Cottrell and my grandmother Opal Robertson1 did come to an end. Nope, that marriage didn’t last, did it? Happy anniversary to my grandparents, a little early this year. I enjoyed reading this article and I envy your having this type of personal information about some of your ancestors. Usually any factual statement in your articles has a footnote. In fact I always find your footnotes very helpful in my efforts to make use of the material in the article. I was surprised that in this article the many personal comments describing your grandfather lacked a footnote. I’m assuming that they either came from a conversation you had with a member of your family or your grandmother’s diary. Any thoughts you would be willing to share would be appreciated. Personal conversations with my grandmother and other relatives, Harold, and you’re right: they should have been footnoted. Lovely! Touching! Thank You for sharing! A beautiful story, Judy. It brought tears to my eyes. I don’t have any written evidence of how my grandmother felt when her husband died suddenly, leaving her a widow at age 39. I have only the fact that even 40 years later, she still spoke of what he would have thought, or liked, or did. The day I found a copy of his burial certificate with her signature and the details of his death, I felt stunned, as if I were witnessing it just moments after she signed it. He was buried 200 miles from where they lived, in a cemetary with many other family members. Forty-five years later, her sons took her body nearly 1000 miles to be buried beside him. Those two facts alone — that she would still speak of what he would have thought all those years later and that she was buried 1000 miles away from her home just to be buried with him — tell you a lot. That was so beautiful. Thank you for sharing their story, Judy. My response to that beautiful love story was somewhat different. I laughed, when I got to the line about the fact that they couldn’t get married because he was underage, so he needed his parents’ signatures–and they were dead. I could already see the top of the marriage certificate, and remembered that he is one of your ancestors. So somehow, this marriage had to have taken place, and lasted “long enough.” What makes it so touching, of course, is that you have her diary to prove how much the marriage, and the man, meant to her over the course of more than half a century. Thank you, not for the first time. I actually have proof that he lied about his age, Doris: I had his signed sworn statement that he was 21… signed and sworn to when he was barely 18. Awwwww! So sweet! We would wish that all our ancestors had this type of love story, even though we know that many sadly had to marry for survival or for reasons other than the heart and never knew love. What a treasure to have your grandmother’s own words telling the children who would come from their love of its depth and of her sorrow upon losing him! It is by far the sweetest of the sweet stories of my family, for sure. I didn’t doubt for a minute that you had the proof that he was underage. The story wouldn’t have made sense otherwise. What made me laugh is that my eye’s always running a bit ahead of where I’m reading, so when I recognized his name as your ancestor, I knew they actually had married, her mother’s druthers or no. The sweet part is her diary entries, of course, and you hold off on that lovely punch line until the end. The way you structure your stories is part of what makes your blog my favorite to read. Thanks so much for the kind words, Doris! I love this story, Judy, as it reminds me so much of my own. My husband and I were both 18 when we announced we were getting married and just 6 months later we did – by then I had reached the ripe old age of 19. Everyone, including my parents (and quite loudly, I might add), said it wouldn’t work. And when we had a baby just 14 months later, we heard a chorus of it again. But this March we will celebrate our 42nd wedding anniversary so I guess we showed them! That is so precious and poignant! Thanks for sharing. That’s a sweet story. Jim, and I’m glad even the doubters finally came around in your case! My parents drove separate vehicles to their 50th wedding anniversary. Proving that sometimes togetherness isn’t the only way to make a long journey! Oh boy. Beautifully written. You are showing me akind-hearted way to approach some very difficult, even shameful experiences of my family members.